A tidal bore is a wall of water about a metre high travelling rapidly upstream as the tide floods in. It occurs where the tidal range is large and the estuary is funnel-shaped (see previous post on this blog). The nearest river to Ireland where bores can be regularly seen is the Severn, where favourable conditions for these hydraulic jumps occur a few times each year. But you do not have to leave home to observe hydraulic jumps. They can be seen in the kitchen sink. When the water from the tap hits the sink pan, it flows radially and rapidly outwards in a thin layer until it slows to a critical speed where a circular hydraulic jump, the sink bore, forms. Although simple to observe, these sink bores are difficult to analyse. where values in the shallow inner layer are used for the flow speed V and the depth H, which determines the wave speed c = √(gH). A hydraulic jump occurs where the Froude number equals 1. Sink bore formed with viscous oil. Note the “Mach cone” generated by the needle in the supercritical region (image from Jannes et al.). The condition Fr > 1 is called supercritical flow. In the inner region the flow is rapid and the water is shallow so the wave speed is small, making the Froude number large. Outside the jump there is deeper water and the flow speed is less, so we have Fr < 1, a condition called subcritical flow. Thus there is a transition from supercritical to subcritical flow across the jump. At the critical radius where Fr = 1, a circular lip appears and the depth may increase by an order of magnitude. The jump is normally stationary but by turning the tap up or down you can change the radius of this sink bore. The sink bore is effectively a white hole. Recall that in a black hole the gravitational attraction is so intense that light waves cannot escape, or pass out of the hole. A white hole has the opposite property: waves cannot enter the region within the jump. The flow in the sink bore decelerates across the jump from supercritical (Fr > 1) to subcritical (Fr < 1). In the supercritical inner region the flow speed is greater than the wave speed, V > c. This means that surface waves are swept along by the flow and cannot propagate against it. They can propagate outwards but not inwards. Consequently, waves outside the hole cannot penetrate the inner region. They are trapped outside, just as light is trapped inside a black hole. A supersonic aircraft generates a cone-shaped disturbance with apex angle 2θ such that sin θ = 1/Ma where Ma is the Mach number, the ratio of aircraft speed to the speed of sound. In cross-section we see a wake behind the aircraft, with angle 2θ. A similar triangular region can easily be formed in the sink: put your finger, or a needle, into the inner disk of water and a V-shaped disturbance forms. This is like the Mach cone (now the Froude number Fr plays the role of the Mach number Ma) and the angle can be varied by moving the needle inward or outward. The analogy between the sink bore and and white holes or gravitational fountains is explored by Jannis at al (2011) at the Universite de Nice. They found that the angle θ tends to π/2 as Fr decreases to its critical value 1, confirming that the jump is a white hole horizon. The figure above (from Jannes et al.) 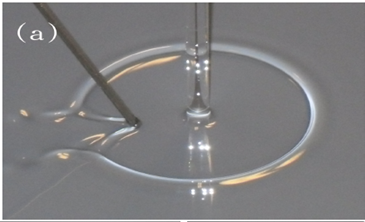 shows the circular jump and the V-shaped disturbance for an experiment using viscous oil. Jannes, G., R. Piquet, P. Maïssa, C. Mathis, and G. Rousseaux, 2011: Experimental demonstration of the supersonic-subsonic bifurcation in the circular jump: A hydrodynamic white hole. Phys. Rev. E 83, 056312.